In this book he says that there was a discussion about the fact that Obamacare would slow down the economic recovery in this country and they knew that before they passed it. But they concluded that we would all forget how long the recovery took once it had happened, so they decided to go ahead. The idea that they knowingly slowed down our recovery […] is something which I think deserves a lot of explaining. You know, I expect political candidates to bend the truth a fair amount. Maybe I don’t like it, but it’s the way the game is played and it’s the way the game has always been played. But Romney’s willingness to flat-out lie is singular. Usually presidential candidates leave that kind of thing to surrogates, so they have deniability if they’re called on it. Personally, they limit themselves to cherry picking and semi-defensible twisting of reality. After all, a plain lie is so very unpresidential. But Romney doesn’t much seem to care about that. I guess he’s figured out that something like this works on the campaign trail but isn’t a big enough deal to ever attract any national attention. So why not? In any case, Jon Chait has chapter and verse of the truth here if you’re interested. 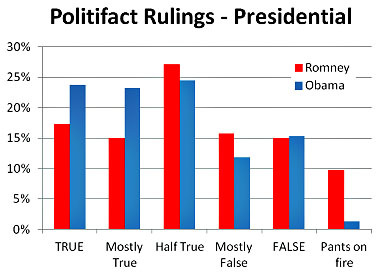 The chart comparing flat-out whoppers between Romney and Obama comes from one of Andrew Sullivan’s readers.